Click on a person in the picture to the right, or on their name above to learn more about them. Jason Wells founded Ring of Fire in 1997 at Tualatin Valley Jr. Academy, in Hillsboro, Oregon. During his "formative" years as a high school handbell ringer in southern California, he remembers attending a concert of Katsumi Kodama's Glee Ringers from Japan and being inspired to chase a similar dream here in America: Walking out on stage with a vibrant choir, playing the most exciting music written for handbells, and doing it all from the heart! While in college in Massachusetts, Jason studied music, performing trumpet with the New England Youth Ensemble in 26 countries as well as five times in Carnegie Hall, under the direction of choral great John Rutter. In 1993 Jason started his first handbell choir on the small island of Palau, thousands of miles from anywhere. It was in 1996 that Jason accepted a teaching job at Tualatin Valley Junior Academy and soon organized Ring of Fire. 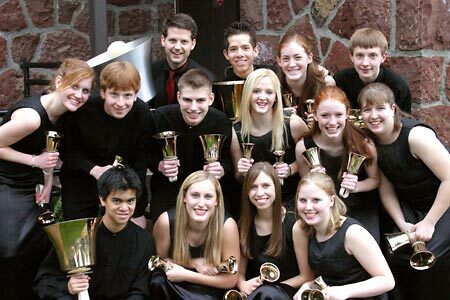 Jason currently serves as a clinician throughout the U.S. and Canada, energizing choirs and working to spread his passion for excellence in handbells.